"A Professional UK Voice Actor Specialising in Video Games, Animation and Dynamic Narration"
energetic, engaging, friendly, smooth and unique. A versatile performer and character actor capable of tackling almost any role put in front of him, his vocal flexibility ensures that his clients get the authentic voiceover that they need. Possessing a natural flair for the weird and extravagant, his voice acting adventures have seen him portray many different personas in a wide variety of video games and animations. Anything from your average guy next door, to a dark and sinister cultist, an energetic arena announcer, a tech obsessed goblin, a demon from another realm, a hardened soldier, a crazed anarchist, a stoic knight.....the list is seemingly endless. George endeavours to deliver dynamic and believable performances that truly bring characters to life. With an ever growing list of satisfied clients his creed of never giving anything less than 100% no matter how big or small the role, ensures that they are guaranteed to receive genuinely emotive and authentic performances every time. Flexible regarding rates and am more than happy to discuss your needs, budget and any particulars of a role. Numerous mods and other small projects. 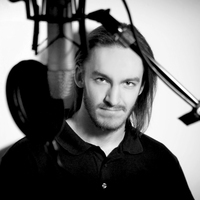 "George has played a huge part in the production of voiceover for FORCED SHOWDOWN – one of the most praised features of the game, and that is no small feat! Through his extensive and professional collaboration on the execution of voiceovers for the game, he brought a very high level of expression with his own voice and a multitude of ideas on how to best bring the characters to life. George voices two of four playable characters and 4 of the 11 bosses in the game - displaying great diversity and skill. He was also consulted for the rest of the character roster and was always available for quick voice tests and comments on new characters. I would recommend him for any production, no matter the size. He works quickly, delivers on time and with a great professional grade setup the audio quality is superb.No need to read any further, just get an audition from him!" "George is not only adaptable and versatile, he is a consummate professional. His delivery of requested product is always on time (or faster) and is of the highest quality. He takes direction and suggestion very well, and is able to adapt his performance to what you need or hear in your head. His voice is lithe and limberand capable of many different timbers and attitudes. I'd recommend him for any project." "...an amazing range of styles..."
"I've worked with George on several projects and he has now become our go-to guy for any kind of voiceover work. He has an amazing range of styles and is a consummate professional - he has a quick turn around and he's able to understand exactly what needs to be deliveredand how the files should be organised. George also has a great sense of humour and is constantly looking to adlib, always surprising us with what he comes up with. I can't recommend him highly enough!" "...the utmost care for quality..."
"George joined our development group a few years ago now and is one of the most talented voice actors I've had the pleasure of cooperating with.He always promptly delivers hisvoiceoversand has the utmost care for quality.I've workedwith Georgefor over 3 years now and I couldn't imagine the mod without him."